Today was a much nicer day than predicted. It was cloudy most of the day but early afternoon we actually had a little sunshine. Nice. The rain didn’t really start until around 4:00 this afternoon. We had some showers and drizzle earlier but no significant rain until late afternoon. The long term forecast still doesn’t look very cheerful – rain every day for the next 10 – but makes us just look forward to heading south again. That won’t happen for a few weeks, but we will be busy and time will go by quickly. Today we worked around the house and FRED. 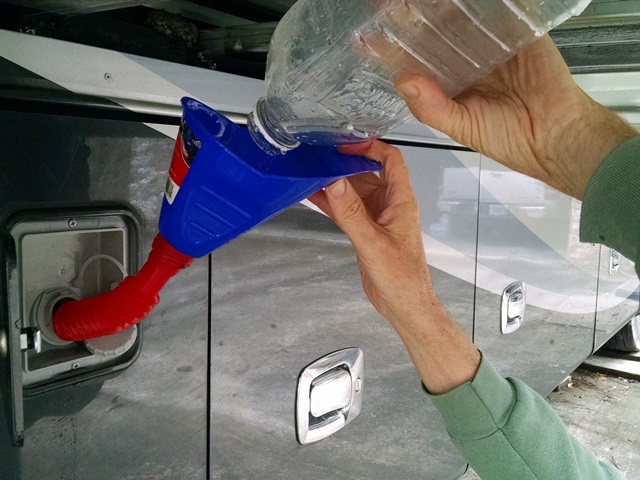 We sanitized the coach’s fresh water system. We had planned to do this chore when we un-winterized in Florida but since we had to leave so soon after getting set up it never happened. We try to sanitize twice a year, roughly January before we head to our winter projects and June before our Constructors project. We know some people never sanitize but we feel it’s the safe thing to do. 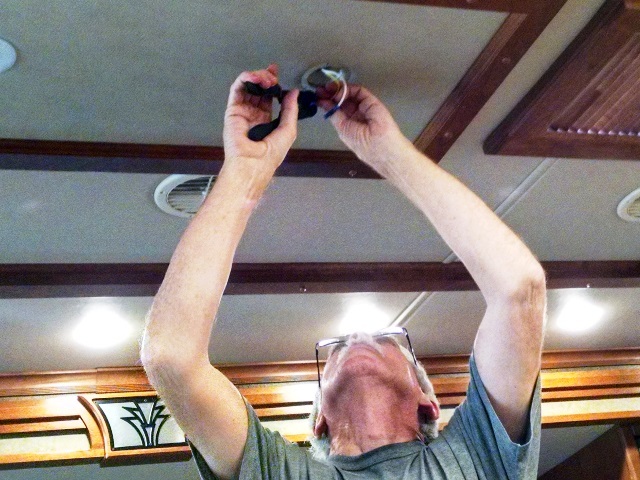 Max also changed out one of our living room ceiling lights today. One of the LED lights started flashing like a strobe light. Very annoying. A week or so ago it only did it after the light had been on a considerable time, but recently it had started strobing whenever it was turned on. We quit using the overheads and just used the accent lighting for the past week. The light was not problem to change out, but now we have to get Tiffin to send us a replacement. We were fortunate we had purchased an additional light we planned to install in a dark area under the kitchen cabinets so we had that one on hand. We also worked on catching up some paperwork and have lots more of that to do. We again got to walk the track with Barry and Donna this afternoon. We did a total of about 4 miles today. Trying to get back into a routine of some sort since in some ways we feel sort of lost right now. We always love catching up with Barry and Donna. Blessed to have such wonderful friends. 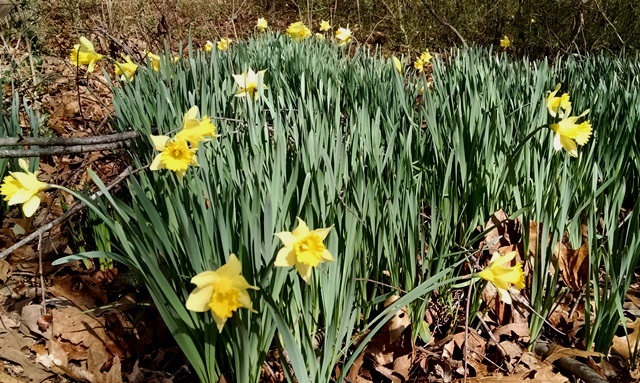 The jonquils are really starting to bloom now. We first noticed them when we returned from Juno’s funeral Wednesday afternoon. It was like they sprung up during the service and were there just for us. We had not noticed them Wednesday morning. It was another one of the little blessings that comforted us that day. That’s about it for today. Right now we are enjoying listening to the rain and watching a movie. Hope you are having a great weekend. Don’t forget to be in prayer for services tomorrow. You are both on our hearts every day. May you receive Our Lord’s blessings of peace. Love you.